Home » What are the Qualifications of a Mayor in the Philippines? 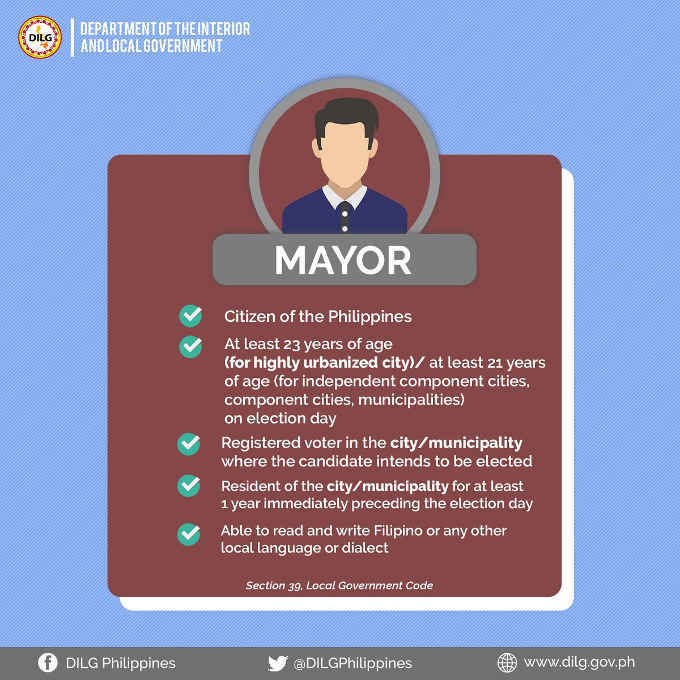 Home » Government » What are the Qualifications of a Mayor in the Philippines? What are the Qualifications of a Mayor in the Philippines? At least 23 years of age for highly urbanized city, At least 21 years of age for independent component cities, component cities, and municipalities on election day. Registered voter in the city or municipality where the candidate intends to be elected. Resident of the city or municipality for at least 1 year immediately preceding the election day. Able to read and write Filipino or any other local language or dialect. Able to read and write Filipino or any other language or dialect. At least 23 years of age for highly urbanized city, At least 18 years of age for independent component cities, component cities, and municipalities on election day. Registered voter in the district where the candidate intends to be elected. Resident of the district for at least 1 year immediately preceding the election day.